Maximizing website conversion rates remains one of the single biggest challenges for marketers today. Effective SEO and PPC can significantly increase website traffic. But raking high on search engines and driving website traffic is just the first step. Your site needs to keep visitors’ attention, convey the value of your offer and compel them to take a desired action — complete a form, download a document, or call your business. If your website conversion rates are lacking, your landing page design may require an overhaul. The question you have to ask yourself is: how many leads or sales are you losing due to sub-par landing page design? The good news is website conversion rates are something you can directly impact and improve. Even small landing page design changes can dramatically impact visitor engagement and conversion rates. In the second version, a simple change produced big positive results. By choosing a photo of a baby “looking” at the ad’s headline, users’ eyes were drawn to the text. Our eyes are naturally drawn to look where others are looking. Even if it’s a picture of a baby in an ad. 1. Choose an image that supports the call-to-action. It’s easy to simply slap a header image from a stock photo site on your landing page and call it a day. But it can pay off to use an image that works in tandem with your headline and call to action. The right image isn’t just eye candy. It’s there to convey an important message to the user, and to provide important context. Digitization has caught up with us and is taking root in all parts of our lives. From businesses to individuals, all strive to carve their niche in our digital world. Both newbie web designers and some of the experienced hands who have been in the industry for decades still believe that a successful website is all about the visuals. To some degree that is true; designing aesthetics and visuals are of great importance, but another aspect that should be recognized is compelling writing. The textual content that you write is just as significant as the images that you will use and below are the reasons why. Forget the website for a minute, what do you do when you want to grab someone’s attention? You will probably shout or even scream to achieve this. The same concept applies in the online space. So how exactly can you grab attention online through your website? Images can work magic, but they are not enough as attention-grabbing tools by themselves. It’s the content that helps your visuals attract and hold the attention of web visitors. By using engaging content, you will be able to make a point in a precise manner effectively. You can create an element of surprise with your content, use it to shock your audience or use it to engage and pique the interest of your audience. But even as you are about to put down your words into writing, you should know that the content that you come up with must be written impeccably to grab attention. Different kinds of sites have different expectations, but they all have a common requirement. They all have to look credible. It’s a logical requirement if you are using your website as a tool to help you sell something, promote a cause or indulge people in doing specific activities. The bottom line is, you need them to trust you and to achieve that, your website must look reliable. The good news is it’s not rocket science to create a robust website that looks serious. Just like mentioned above, having the right visual elements and arranging them nicely is not enough to cut it. Your site still won’t appear complete and will require a cherry on top which is the added text. With good writing, not only will your website engage audiences, but it will also make your site weblink appear credible. You can also subtly achieve this. It is unnecessary to write about the high quality of your products or brag about your high level of honesty. On the contrary, such statements could potentially have the opposite effect on your audience. When it comes to reputations of companies, it’s best when it speaks for itself. Web design trends have undergone an apparent change as one of the most dynamic industries in web technologies. It is 2018, the eighteenth year of the millennia, a year for exploration of the web technologies in a dynamic perspective. Web technology is unbeatable and with the ever-rising technical challenges as more products get into the market, the only choice of web designers is be innovative and put up with the changing trends. They have to ensure that their designs fit any internet device be it a desktop or a smartphone. Here is a list of 8 ruling web design trends that will shape the web industry in 2018. Smartphones have surpassed desktop and notebook computers in browsing. According to Statista, a renowned scientific research organization, projections hold that by 2020 over 40 percent of the population of the world will own a smartphone. Interesting facts by the same organization project an annual smartphone shipping capacity of 1.7 billion by 2021. The implication is that most people will surf the net using smartphones. 2018 resolution is to give priority to mobile web designs. This year, 2018, is a year of transformative web design as designers embrace the reality of battling with technical challenges to give their users a satisfying experience in their web products with a top priority on mobile designs. Have a look on 7 essential principles of mobile web design to get designed a good mobile site. Since its launch way back in the 1980s, the Internet has undergone several evolutions. In the early stages, there was no need for complex, image-based sites with diverse variations in typography, font, or any aspect regarding visual content. However, with the progression of time, such websites are today’s need for any business that wants to establish its online presence. With this brand-new trend, the demand for elegant web layouts with compelling animated designs has become the present norm. These websites, which have a unique feature to tell stories, leave a considerable impact on the psyche of the customers and users. Today’s modern-day website, which makes use of artificial intelligence, is an extremely well-weaved and a seemingly complex collection of audio-visual images and content that are designed to convey information so that it leaves a lasting impression on the consumer. In the present digital age, surfing websites powered with Artificial Intelligence or AI is a grand experience for the user. With millions of dollars pumped into the industry, website designing is a great and profound market. There are thousands of web designers and trained designing experts who tirelessly work to create captivating websites for end users, be it a business or an individual. This growing demand has additionally resulted in the emergence and creation of cutting-edge graphic design software, which is used to create gob-smacking designs. The high demand for mesmerizing designs has further attracted one more aspect of the Internet and its technology, which is undisputedly artificial intelligence. We can all agree that the best websites are designed for both users and search engines, right? That means you never should sacrifice beauty over function, or vice versa. 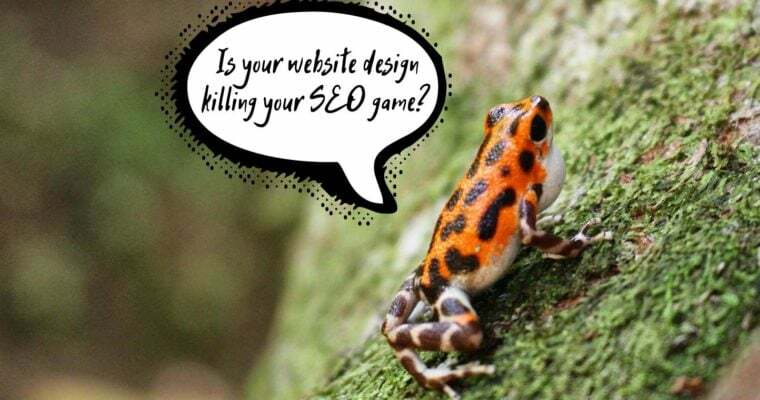 Check your website for the following six common mistakes to see if your beautiful design is preventing your pages from ranking high in search engines. Imagine entering a website with a nice background picture, a well thought out font, and an elaborate color scheme. It looks amazing. Browsing through feels like a walk in a beautiful garden. Too bad nobody will find it in search engines. Why? Because very often website designers and developers forget about essential SEO elements. The most common offense is removing an H1 tag just because there is no place for it on the page. The H1 tag is one of the first elements search engine crawlers will look at to determine what the page is about. Having this tag, and including your target keyword, improves your chances of ranking higher.